The Vietnamese Golden Ball Award 2018 officially kicked off yesterday in Hồ Chí Minh City. This year’s award includes categories such as Man’s Golden, Silver and Bronze Ball, Woman’s Golden, Silver and Bronze Ball, Man’s Golden, Silver and Bronze Futsal, Best Foreign Player, Best Male Player (under 21), Best Female Player (under 21), and Favourite Player, voted by fans. Voters for the award include football experts, teams’s head coaches, coaches and captains of V-League, women, futsal clubs and reputed sports journalists all around the nation. The winner will be announced in the end of this year. Vietnamese Golden Ball Award, also referred to as Vietnamese Footballer of the Year, is an annual award for the best performances of Vietnamese footballers over the previous year. It was first started 1995 by Sài Gòn Giải Phóng Newspaper and was also recognised by Việt Nam Football Federation (VFF) to belong to national award system. The first winner was striker Lê Huỳnh Đức. 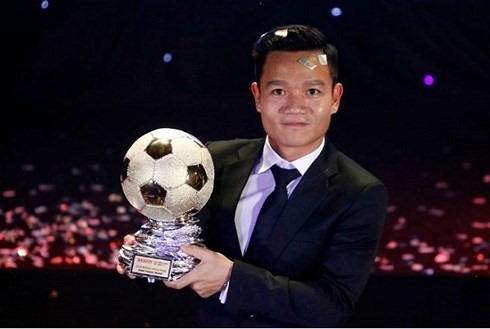 The current holder of the award, as selected in 2017, is Quảng Nam Province’s midfielder Đinh Thanh Trung.